↑ Prichard, Iltudus Thomas (1869). The Administration of India from 1859-1868: The First Ten Years of Administration Under the Crown. London: Macmillan & Co.
↑ Buckland, Charles Edward (1901). Bengal under the lieutenant-governors (v.01): being a narrative of the principal events and public measures during their periods of office, from 1854-1898. Calcutta: S K Lahiri. 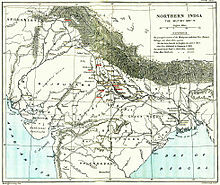 ↑ "British Empire: Forces: Campaigns: Indian Mutiny, 1857 - 58". www.britishempire.co.uk.